Exploring local cuisine can play an important role in understanding and appreciating a new culture. Food can provide both host families and Ayusa students alike a meaningful cultural experience to discover the practices, rituals, and beliefs that surround food and its consumption. 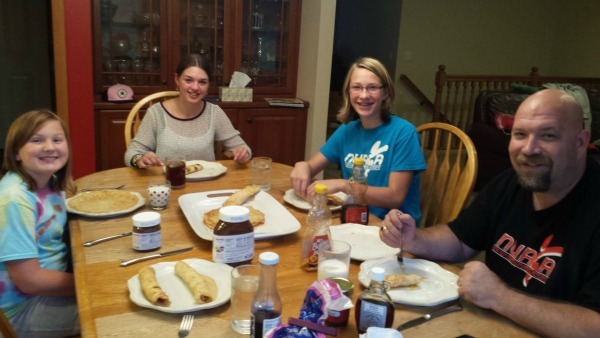 The recipe below was shared with us from Lotte, Ayusa student from the Netherlands, who prepared pannekoeken for her host family in Minnesota! A pannekoeken is a Dutch pancake of sorts. It is larger but thinner than traditional American pancakes - They are most often made to be up to a foot in diameter! Unlike in the United States, pannekoeken are eaten both for breakfast AND dinner in the Netherlands. Entire restaurants dedicated to pannekoeken, called pannekoekenhuisjes, offer a wide variety of fillings and toppings, from sweet to savory, for everyone to enjoy! Add one cup of flour, both of the eggs, and 2 cups of mils in a big bowl to mix until smooth. Add the other cup of flour to mix it in. We separate the flour to prevent getting big pieces in it. You want it to be smooth! Set your stove on medium and add a small amount of the butter to a pan, just enough to smooth out the pan. Use a big and flat pan that has a small rim. If you do not have a big pan with a small rim, you just need to make smaller pannenkoeken. Flip your pannenkoek when the bottom side has a dark golden tone. It's better to make the brown color a bit darker than lighter. Put your pannenkoek on a plate when both sides are ready. Add your toppings and roll your pannenkoek like a wrap! Use your fork and knife to eat all of your pannenkoeken, it might be sticky because of the toppings. My favorite kind is with banana and syrup! We were with five family members, and I made a double batch, as there might be occasions when you only get 8 pannenkoeken out of the recipe. Most people eat 2 or 3.